The quilt project teaches following directions, pattering, colors, and working on concepts of left and right. Make a square 9'' x 9'' on s 9" x 12'' piece of paper. Subdivide into the nine squares with each small square 3'' x 3''. This serves as template. 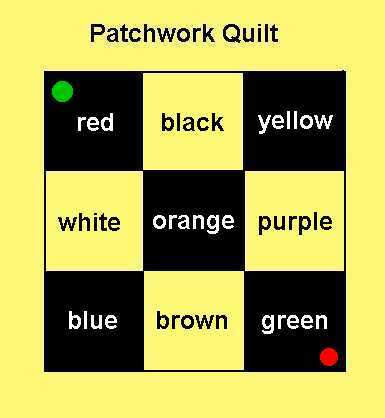 Make 3'' x 3'' squares in red, orange, yellow, green, blue, purple, back, brown, and white. Place a green dot in upper left hand square and a red dot in lower right hand square. These indicate starting and ending positions. Have children glue on the colored squares in prescribed sequence. It helps to have a finished quilt for them to view. Story for the day: The Quilt Story by Tony Johnston.